Inheriting family china from your mother, grandmother, or other family members is truly a special honor, but sometimes we end up with more of these porcelain treasures than we can adequately display. Adding an inherited set or two to your own china may leave your cabinets bursting at the seams! Rather than allowing these mementos to go unappreciated in storage, there are many ways you can use pieces from your collections as design elements throughout your home. Read on for some great ideas for using china in new ways! Tea cups make beautiful pots for small succulents or a window sill herb garden. The only modification you’ll need to make is to drill a small hole in the bottom for drainage. Pair with the saucers and you have a perfect method for catching runoff when watering. Plants housed in these containers are easily moved from place to place throughout your home, whether to change the amount of light they receive, or for changing the look of a room. 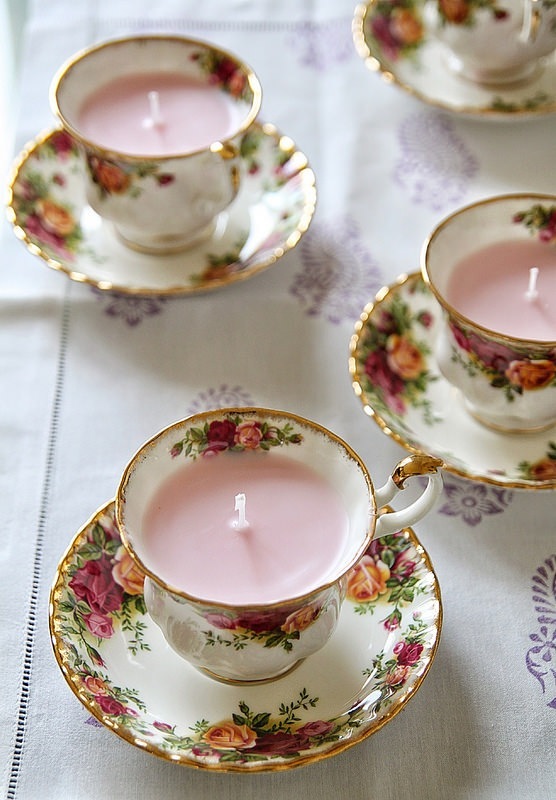 Teacups also make great holders for small tea lights and votive candles. If you are the crafty type, you can even try making your own candles with wax flakes, wicks and essential oils. This is an easy craft to try with your kids, and homemade candles make great teacher gifts, if you’re looking to part with mismatched cups. Many china collections include a tiered cake stand (sometimes referred to as a tea stand, since they were often used for serving pastries at tea time). Re-purposing a cake stand as a table or dresser top jewelry organizer allows you to appreciate the piece while also organizing frequently worn jewelry items in an easily accessible place. Use a single plate or bowl from a set to collect change, receipts and other items that accumulate in pockets throughout the day. Large serving dishes and even large dinner plates can become decorative mirrors with a little work. Measure the round portion of the plate bottom, then purchase a suitably sized circular mirror. These are available at most craft supply and hobby stores. Attach the mirror to the plate with epoxy, and allow to dry. Now you have a unique mirror to add to any room that needs a little extra pop. Much like making a mirror, serving dishes and large dinner plates can also be used to make decorative signs. Instead of attaching a mirror to the plate bottom, paint with black chalkboard paint. Display on a wall or on a table top plate stand and keep chalk nearby for family announcements. Would you like to try using teacups and other pieces for an indoor herb garden? Read on for tips on which herbs are your best bets for growing in your kitchen!